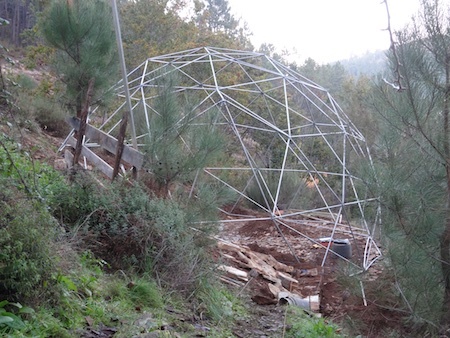 The previous post on the geodesic dome greenhouse outlined the logic in choosing a dome for this site and how it was by far the better option for fitting in all the things I wanted to have in this greenhouse. These include an aquaponics system and a bathroom as well as growing space for tropical and frost-tender fruits and vegetables, seed growing areas, a rocket-stove water heater and a worm farm – a fair bit to cram into an area measuring just 7x5m at the outset. 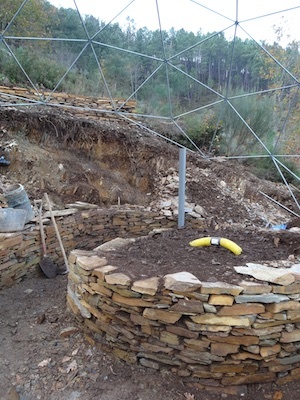 I also wanted to build in a subterranean heating & cooling system (SHCS) to make even better use of all the thermal mass present in the solid bedrock floor and back wall. This is a proven low-tech solution for maintaining comfortable temperatures and humidity levels in the greenhouse year round. 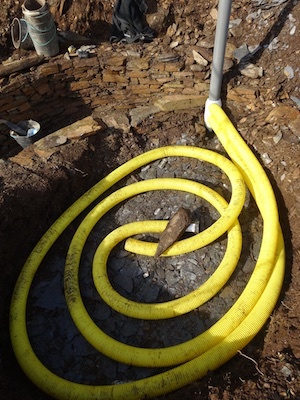 It can minimise or even eliminate the need for supplementary heating or cooling. It works like this. Vertical pipes containing in-line duct fans are placed at various points in the greenhouse. 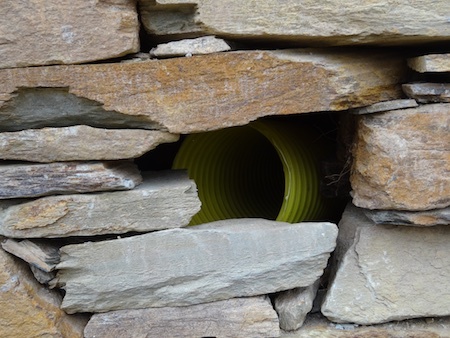 They connect to underground perforated drainage pipes which cover as large an area as possible. 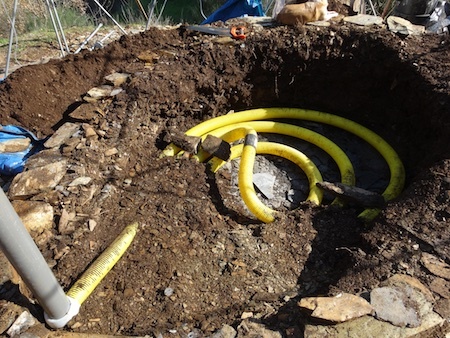 The underground pipes exit at the surface. The fans are set to automatically come on when the difference between soil and air temperatures exceeds a set amount. So when the air is hotter than the soil by x°C, the fans come on, pulling the hot air down into the underground pipes where it’s cooled, the water vapour condenses out of it, and it’s released back into the greenhouse drier and cooler. 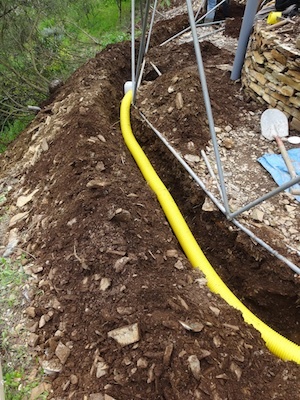 When the air is cooler than the soil by x°C, the fans again come on, pulling the cold air underground where it’s warmed by the heat stored in the thermal mass surrounding the pipes. It exits back into the greenhouse warmer and moister. 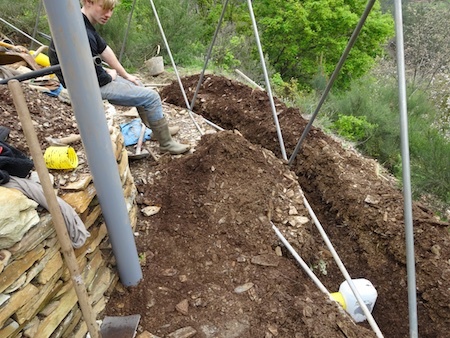 lay the SHCS pipes at the base of the beds and terraces inside the greenhouse as we built them. The first two options would be costly in time and money but allow for an optimal system to be constructed. The third option wouldn’t cost anything but would likely result in less than the ideal length of pipework for the size of the greenhouse. But I reckoned that once the passive effect of all the thermal mass underlying, surrounding and within the greenhouse is taken into account, the greenhouse’s ‘climate battery’ should perform well enough for its climate and situation to make this workable and worthwhile. Winter average temperatures here are around 5°C and rarely get much below -5°C. I’ve seen -12°C, but only once. Ground temperatures are around 12°C. 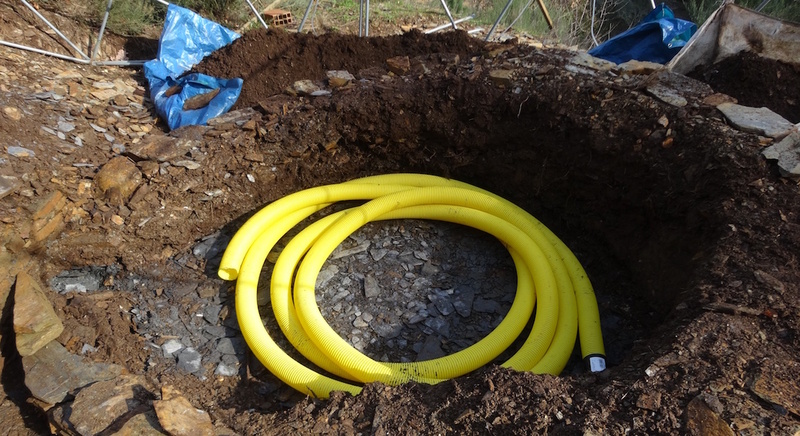 I used 110mm grey waste pipe for the rigid vertical sections and 100mm perforated land drain for the underground sections. These are connected via manifolds made from 5-litre plastic bottles. 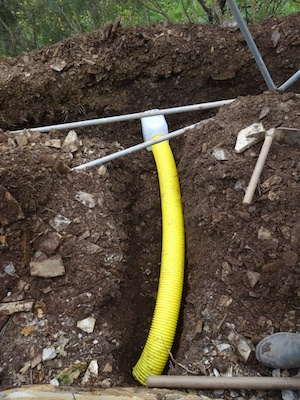 This was very simple to do since the manifolds don’t need to be airtight – the air going through them is passing into perforated land drain, after all. 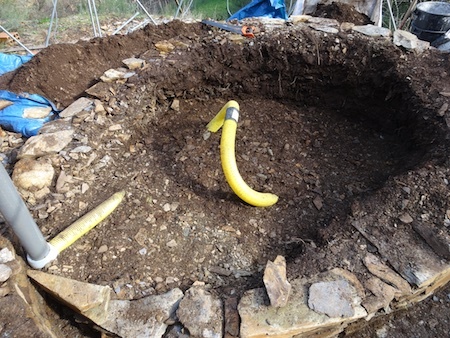 The first section is at the base of the large central growing bed. The bed is roughly 1m deep. 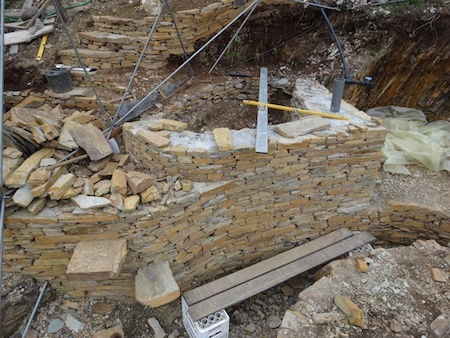 In these images, the walls are only partly constructed. 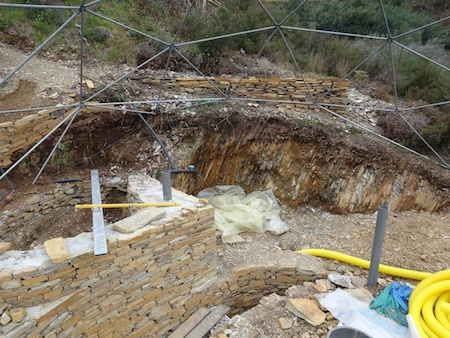 The second section underlies the aquaponics fishpond and terraces at the back of the dome. 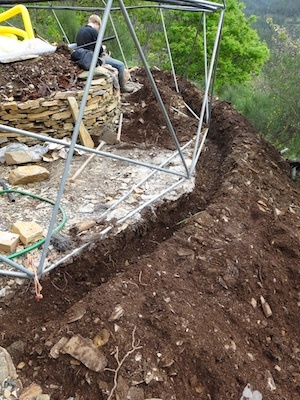 The third section runs round the lower perimeter of the greenhouse outside the frame. Since the heatsink itself doesn’t need to be within the greenhouse envelope – only the entrance and exit need to be inside – we could use this space to our advantage. And there’s no bedrock in this area! 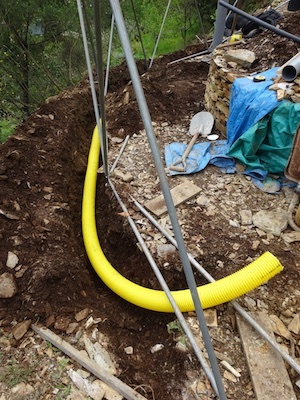 The next stage, after completing the second length of the second section, will be to install the fans and the remaining lengths of vertical pipe above them. Once the control system is wired in and we have solar electricity supplied to the greenhouse, we will be able to complete and test the system. Tuning its performance and evaluating its success (or otherwise) will have to wait until the greenhouse has its covering and we have a whole year’s worth of experience with it, but it already puts out warm moist air on cool mornings through the vertical pipes!